I don’t want to enter my password every time my computer goes to sleep when I’m at home. I’ve set up “Require password 15 minutes after sleep or screen saver begins” in the “Security & Privacy” settings just to be safe when I’m not around my computer. But do I care that much when I’m at home? mmmhhh, not really. 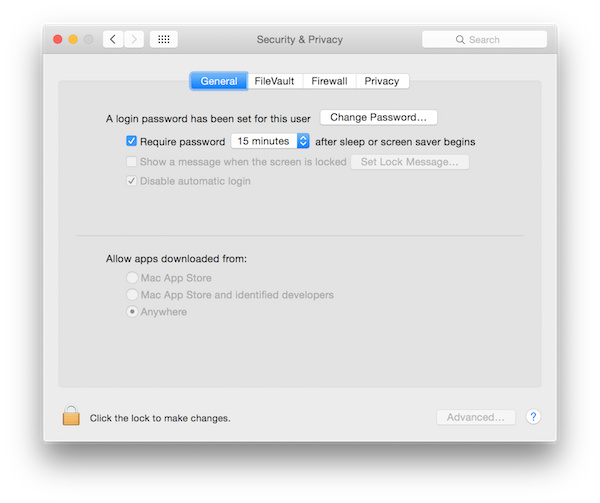 Usually, my computer is in my bedroom, I’m going in the kitchen for a while and then come back later and – boom – PASSWORD, it annoys me. It’s time for a change. I’ve already created another script that uses my SSID1 to determine if I’m home or somewhere else. Without a second thought, I open vi, do few searches to know how to configure the setting with the Terminal. And here is the script that takes care of updating the settings depending on my SSID. SSID="$(/System/Library/PrivateFrameworks/Apple80211.framework/Versions/Current/Resources/airport -I | sed -e "s/^  *SSID: //p" -e d)"
echo "am I home? : $AM_I_HOME ($SSID = $HOME_SSID)"
echo "ask for password       : $ENABLE"
echo "ask for password after : $SECONDS"
Next step is to find a way to call this script when there are a “wifi change”, couple of searches later (I’m encountered just now apps that do or seem to do what I’m trying to achieve, but it’s too late: I’ll built my own command – programmer pride). I end up using: crankd command line (part of MacSysadmin/pymacadmin repository) which is triggering commands on specific system events including network events. I’m following these instructions to set everything up.